Discard that internal rule book! Toot Sweet! ‘Beauty is in the eye of the beholder’ ... ‘one man’s meat is another man’s poison’ … ‘you like it you take it, you don’t like it you leave it’ … what is a cliché for one is original for another’… ‘one man's trash is another's treasure' … there are so many of these sayings around to suit us, and how great it is to realise that whatever you like is fine! So many times we find ourselves being dictated to by ‘what will the neighbours say’ or what is ‘fashionable,’ that we do not surround ourselves with the things we think rate a good ‘okay’ to downright beautiful and enhancing and ‘must have’ (and all those other good words and concepts and ideas) for us as individuals; each with our own tastes, likes and dislikes. Have you said it? No doubt though you have heard someone saying “I don’t know much about art, but I do know what I like!” What could be more different from the broad strokes and flat painted style of Gaughin to the intricate lace of Rembrandt or the melting clock of Dali to – oh dear, this list is endless not so? So when it comes to décor in your container garden area, there is a lot you can consider doing to show your pots off to their best and to give them the context they deserve – after all, you put a lot of effort and money into growing your plants and edibles, so why not follow through with pretty surrounds and quirky ideas and all sorts of other enhancing actions. Here are some … and remember, please don’t get caught up in judging through anybody else’s eyes but your own – if you like it and it suits you and your budget right now, go for it! Choice? I like it! 	THRIFT SHOPS and similar (like swap meets, garage and car boot sales). Frequent these and see what you can find. An old chipped statue? The chip means it has a life, take it. Maybe it will become a favourite bit of background, or be used as part of a water feature or used to balance the conifer or single fruit tree growing opposite. 	At the thrift shop (or garage sale or nursery or garden centre or in you own garage even) maybe you find or see or you have a rusty something? 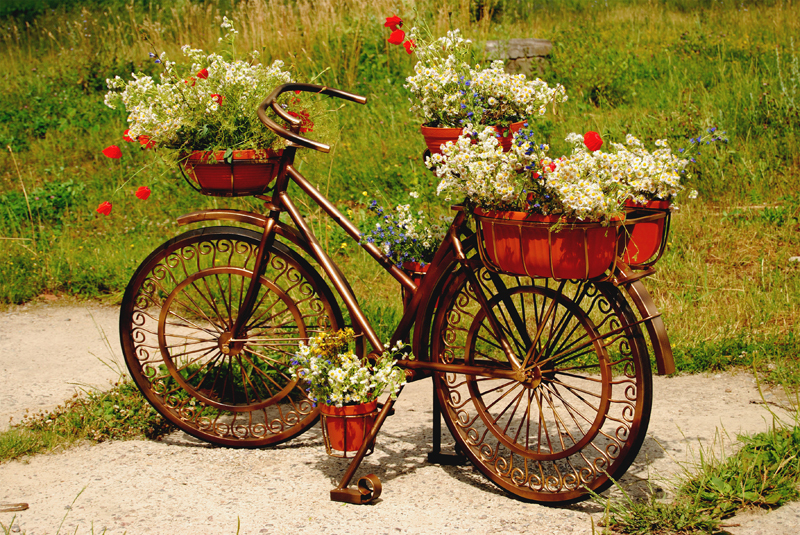 A bicycle for twining over ivy 'topiary' style or convolvulus? a wheelbarrow of petunias or cucumbers? An old curlicue piece of window burglar bar for a trailing nasturtium? A rusty pot holder? What about other mediums like a block of wood (for height) and pot stands and/or stone to offer the butterflies some water? 	QUIET TIME. Create a meditation corner or Japanese Zen garden effect with a beautiful rock or two and sand. You know your area, so you can solve any attendant problems (like how to contain the sand or put the rock/s into place). Be innovative. Mix and match styles – not all has to go with everything else. How about a lazy susan candle holder or incense holder? 	PICTURES – well the sky is the limit here including any piece or art ever done by anyone copied and framed … the Finger of God goes well on canvas (so what if some say it's a cliché), sepia photographs of family gatherings for a family history patch. Have you seen the woodland wallpapers you can buy these days? What about your children’s art brought home from school so carefully? Mother’s and Father’s day cards? You could laminate them and stick them up with presstick so they can be changed monthly. Other memorabilia? You could make a long frame soft board notice board and stick up old theatre stubs to pressed flowers to postcards to … well anything really. Got children or Grand-children growing up around you? How about an old ladder front painted or stained and fixed to the wall. One side has falling 'potties' of seasonal colour while the other side plots the little people growing taller as the seasons go by? What about a wall plaque or two made of hypertufa with a collection of handprints Hollywood style? 	LIGHT. Spotlights can highlight a show plant or featured exotic and could also serve as a grow light for darker corners. Candles? Solar lanterns? Mosaic finishes all over including the use of mirrors to reflect 'the other side of the garden' This can make your space look bigger and give you double reflective pleasure. 	COLOUR. Painted background walls? Murals? Container colours and finishes? Go to the colour wheel for inspiration too - add a storage shelf or two and instead of trying to hide your tools, make a feature of them somehow. 	SOUND – wind chimes, especially if they have been tuned. I have some and just love their cheerful invitation to sit down for some contemplative tea. Of course the sound of water is a fine one too. Recently I went to a garden showing and there was music quietly playing from a speaker high up on the wall. The garden below, ALL in containers, was too beautiful to describe. The owner said she thought it was the music she played and admitted from Mozart and Beethoven to Beach Boys and Bread. “Oh No!” she laughed when I suggested Guns and Roses. 	YARD ART. Well this has become and can become Balcony Art – concrete statues, painted gnomes and faeries, a bottle tree, glass mobiles to catch the light and the wind, ceramic 3-D flowers and birds and suns and moons and other ornaments to hang on walls, colourful tiles, inspiring messages painted or etched on stones (etc). Herb or plant labels? 	KITSCH to COOL. A painted seat or bench of your most admired or hated character? Lava lamps? Taxidermy? Paper lace doilies? Lacquered (stiff) frills on shelves? Honestly add your own then choose. What makes this life so wonderful is that anything goes if there is someone to drive it! And a lot of decor ideas can be temporary and seasonal - after all, a change is as good as a holiday! Sterile uniformity and keeping up or in with the neighbours or the Joneses can be boring and exhausting. Fanciful and whimsical and going for your own kind of ‘bling's the thing’ is in - so enjoy planning and plotting a change of context for your container garden … no reason why not! What do you want your container garden to do for you?